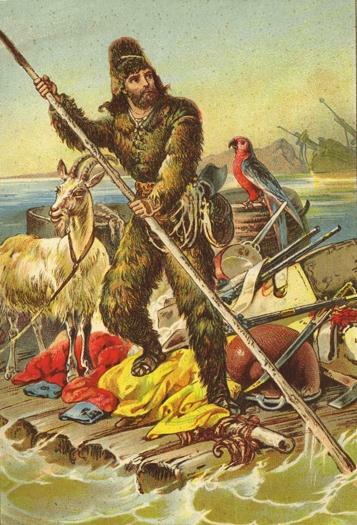 Who among us has not dreamed as a child to go live on a deserted island, after reading (or viewing) of Robinson Crusoe. All of these adventures, the calm and measured life in a tropical paradise. 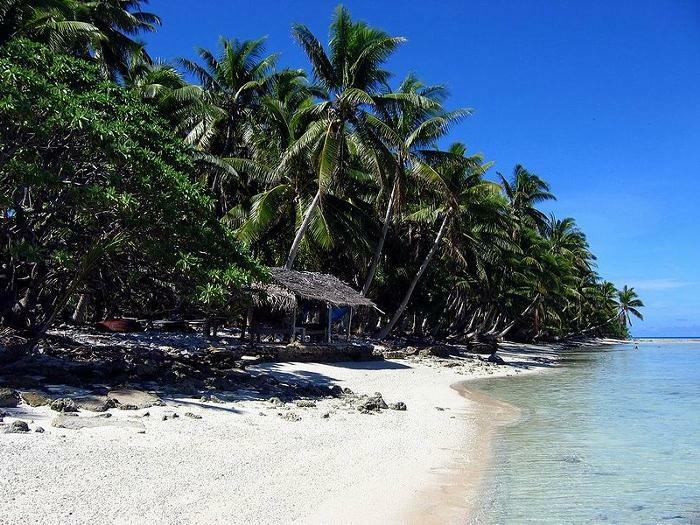 The abundance of fruit, luxurious ocean fishing, spearfishing, coral, white sand, coconut and banana palms, colorful birds nesting on the island, the sun and the lack of a boring civilization. Many people, especially those living in northern countries, dream of an island in the ocean. When he came home from the cold streets, gaining a warm bath and he dream as he relax in the lagoon one of the atoll, with turquoise water. But to realize his dream he prevents a lot of worries and problems in the first place - money. 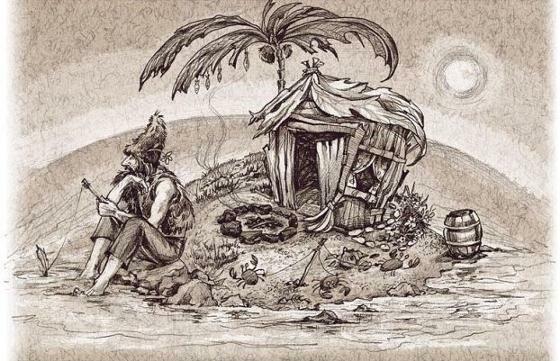 This plan of Robinson Crusoe seems to many a distant dream, "Well, where I am, and where the island?" - They think. In today's world is really hard to find and pick an island for life. This is either already inhabited the island, or it does not have enough resources to live, or it is located very far away. Deserted islands, there are still quite a lot and, even, and many are quite suitable for a normal life for them. Here I will try to analyze the possible islands, their types and features. All the islands are divided into two types - a volcanic island and the atoll. There is makatea - raised atoll, but they are few and almost all occupied. Volcanic island - it is the earliest stage of formation of the island. It is formed by volcanic activity on the ocean floor. Simply put this is the tip of the volcano, active or already extinct. 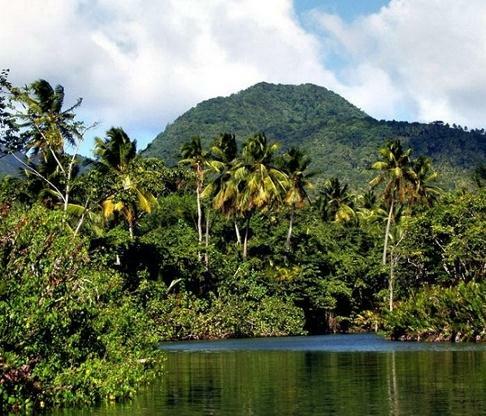 These islands are the best option for Robinson Crusoe (insular seclusion), and the choice of the island, I recommend paying attention to his appearance. Availability of fresh water. This is extremely important to you. In warm climates, you will need a lot of water. The high cliffs of the island catch a cloud, holding water. It is start numerous freshwater streams and rivers. The vegetation of these islands is always very varied. A very fertile soil. Ability to perform a variety of planting. The volcanic soil is rich in minerals and trace elements. Ability to grow many kinds of vegetables and fruits. Height above sea level. 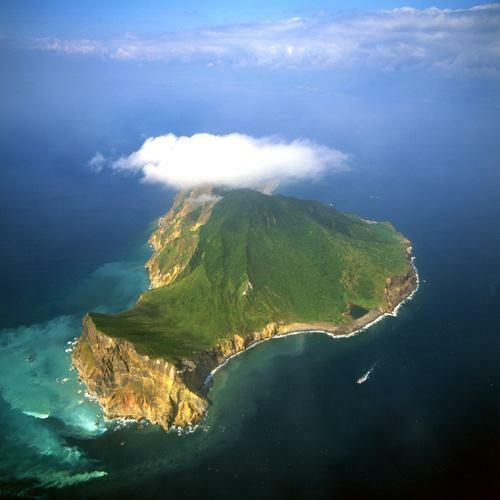 It is an important factor, because of frequent low-lying islands just washes off with water during rainy seasons and the tides, and on a hilly island where there is always hiding. 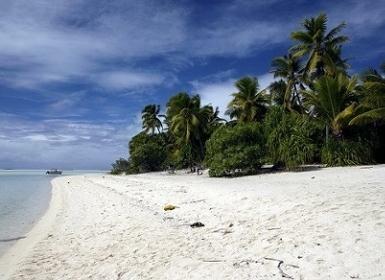 First and foremost, minus the atolls - is the lack of fresh water. Laguna as the rules are always connected with the ocean in small streams, and if not, then the water in it is still salty and not suitable for drinking. Residents of the atolls are digging wells, which produce clean, but slightly brackish water and collect rainwater, which in a season and not wait until it is. Next minus - is the low fertility of the soil. Since the soil consists mainly of coral sand, then there's little that can grow. It follows quite forget about planting and edible wild plants only content, usually a coconut palm, breadfruit, etc. In principle, with an abundance of wild plants, plus fishing - you can live such a life but you quickly get bored. The following negative - it is plain. Atolls in the average height of 2.5 meters above the sea. They can flood water from the tide. 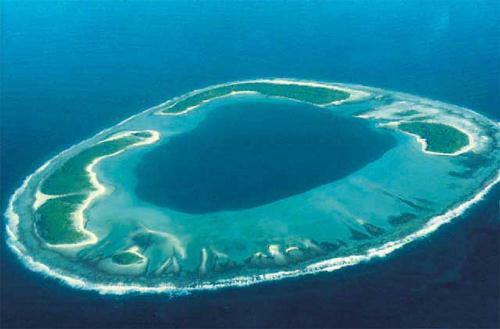 Atolls fine (just fine) suitable for recreation, but not for the settled life. Many people think that having gone otshelnichat the atoll, they will constantly be there to relax, meditate, etc. But their lives become a constant survival, food production, fresh water. Maybe I'm wrong, but I personally adhere to the policy, which will give me stability. proof of sufficient funds for the entire period of stay in the country. Also, you can extend your stay turning to the migration service. Well it seems you are unhappy with the second paragraph of these conditions. You do not like buying a return ticket, especially if one side of the ticket is expensive. But not so bad, my dear! Many tourists know a way around this rule, it is a painless. The procedure is as follows. To begin, we choose our favorite and booking a flight (of course one way) through any site. Then they send us an e-ticket on the e-mail, which we will print it and show to the airport and then our cherished country (well, where we will live) - so they will know that we have tickets back. But the trick is to simply correct in this form (using the text editor) and write the return flight. That is, was one-way ticket, will be two-way ticket. Fly back (if you suddenly want) we can not, this paper necessary only to the employee the airport, than he looked allowed us to register. That's all, so do many tourists who do not want to fly back, or do not know when they will fly. In some countries require that there is at least $ 50 for each day of stay. But you can tell that fly away in a week, and printing fake on that date. This is not a problem, and money you still need. You can simply not take the tickets, in many cases and not ask their. You do so at their own risk. In any case, you decide. We got the cherished island country, but now we ought to get to the promised a deserted island. But how? Need to speak with the local at the expense of trip at the sea, or buy a boat. Necessarily with the motor, because the currents are very strong and can easily carry you into the ocean or back to the island. To communicate with the local will have to study English. He is now in many countries as a second language and even in French Polynesia, many speak it. Of course there are people who do not speak English, for example, villagers and tribal people - they have their own dialect, but usually someone of English is still possible to find among them. And is not necessary that the delivery to the promised island will cost mere pennies - local can quietly charge a higher price and then have to negotiate, or find someone else. Ideally, of course - to buy a boat and not on who addicted. Just getting to with the help of local could cost you deportation, and all because of the local can be a very "long tongue" and he blabbed about you to others people, rumors fly fast! To avoid this, you can just stay for a while, along with local, long as a tourist. Most of the simple village natives well disposed towards tourists, and not only by the fact that you have the money, but because for them it is an exotic (as well as for us they too) and you are very interesting to them, especially children. If you are kind, polite person, in most cases you will not refuse a request to live among them. f you do not have enough money to pamper them to, you can try to work with them, that is, assist in various work, whether it be farming, fishing, garden, etc. In short, you need to make friends with them, and then, when the validity of your visa will be coming to an end - to say that I like it here and I would like to go to the island (or stay with them later). That would be the most ideal option for you. Local people are always help you, help you with the boat. Will throw you to the deserted island. You will live on his deserted island, and to know that in case of trouble you have friends who will help you in difficult times. Ability to get along with people in such situations - very good quality! Well, if you're a bad person, the local is still realize over time, but it is unlikely you a bad person, because only good people can decide on such a step - an islands hermit! The most important tool on the island - a machete. This is an indispensable tool in any jungle, and most of the deserted islands in its depths covered rainforest (jungle). The usual knife, which you will do the rest of the work, where the dimensions are too machetes. The axe is well suited for cutting and for large as well as a hammer. Saw. Principle the possible and without it, but it's better! A set of dishes, which includes pots, plates, cups, spoons. Over time, you've done a plate of coconut, and spoons made of wood, but in the beginning you will need. A flask of water. In it you'll carry with you everywhere on the water, I recommend taking at least 2 liters. and a strap so you can hang on the shoulder. Lights. It would be nice to have a dynamo lights, as well as the headlamp flashlight. First aid kit with essential medicines + repellents against mosquitoes. Removable shoes, clothes. Take cotton clothes (shirt, shorts, hat, shirt with long sleeves), two pairs of shoes better than a good (not Chinese) sandal. Tight clothes bolonevuyu take not recommend, because you're in it to cook in the heat. Set for fishing. Spinning lures, fishing line (the higher the better) coil hooks. The rope is thick, thin. Seeds. But note that in some countries, the import of seeds allowed only with special permission, and you will have it? Solar panels or mini wind turbine would be very helpful, you could infect a variety of batteries, including to your smartphone, as well as GPS. It is also necessary to take a lot of container under the water.Canisters are different, buckets, containers. The first will be useful to collect rainwater. Well, a tent or an awning for the first time. I think the backpack of 50 liters. Better than 70-90. So I recommend to take a lot of cellophane packages of different, such that they remove things such as: documents, camera, money, etc.